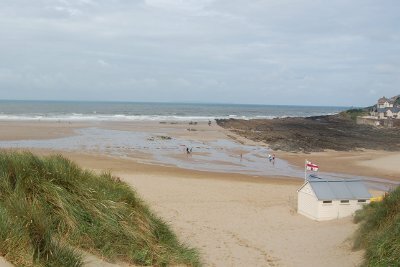 This is a review of the Ruda holiday village in Croyde Bay (near Ilfracombe) in Devon. This is a Parkdean holiday park, with static caravans an area for touring caravans (across the road) and a camp site. The camp site part is one of the biggest / busiest I’ve seen, which may be because surfing and camping tend to go hand-in-hand. This is my second visit to the site, both of which were camping, but the previous visit was many years ago. We stayed for two nights taking our two young children on their first camping holiday. We have been camping several times before we had our children and we were on holiday with friends who are seasoned campers. The pitches are allocated before arrival and are a good size. Although a very big camp site it was very popular and it was good that we were booked in advance. The first thing that hit us was the view from the site. It’s great to wake up in the morning and see the sandy beach and sea. Toilet and wash facilities are good, although two of the showers were broken leading to queues in the morning. The facilities were clean. Drainage for most of the areas is excellent. Despite lots and lots of rain (I heard estimates of 1 months normal rain during 48 hours) our pitch did not get muddy. There was a part area which did not have tarmac roads and as a result had become very muddy, but as I said there had been an exceptional amount of rain. There is good access to the beach directly across the road from the site. The beach is great! Nice sandy bay with separate marked areas for swimming and surfing with a lifeguard for each. There are also rock pools at both sides of the bay for those that like exploring for crabs. We did see a large smack of jellyfish in the rock pools [apparently that’s the correct collective noun as mentioned in "My Grammer and I (or should that be Me?)" ]; I don’t know whether that relates to a large number of jelly fish stings amongst swimmers. On site there is a well stocked shop, including lots of camping accessories that you may have lost, forgotten or have blown away. There is also a takeaway that is open until quite late and a club. We didn’t go to the club in the evening on this holiday, but it’s comparable with other holiday park entertainment. There is a swimming pool complete with rapids, slide and toddler pool. There is an additional charge for using the pool which is £1.50 per person for residents (costs are higher for non-residents). The cost of the pitches is quite high (we paid £29 per night), but the facilities and proximity to the excellent beach make it worthwhile. All in this is a great site and I would recommend it to anyone looking for a family friendly site for camping in North Devon. Other days out and holidays with children and babies. This entry was posted on Tuesday, July 28th, 2009 and is filed under Babies, Children, Holiday, Tourism. You can follow any responses to this entry through the RSS 2.0 feed. Both comments and pings are currently closed.